Basic Course in Nepali is suitable for the people planning to live and work in Nepal long-term (two years or more). Our Basic Course runs for 12 weeks and the students on this course will attend 15 hours of classes per week. However, customized courses can also be arranged according to individual needs and length of stay in Nepal. Most of the classes are either one-on-one or in pairs and classes are kept lively by using audio-visual materials, varieties of games, role-play and many other activities so that learners learn by practical way. Some traditional activities that we also believe to be effective learning strategies often involve working individually. Each lesson contains a set of vocabulary, verbs, useful expressions, conversation practice, text and grammatical explanation with examples, pair work verbal exercises and written exercises. Every day, you will work through the syllabus which is carefully graded with gradual progression (easy to complex) of teaching items and grammatical structures. 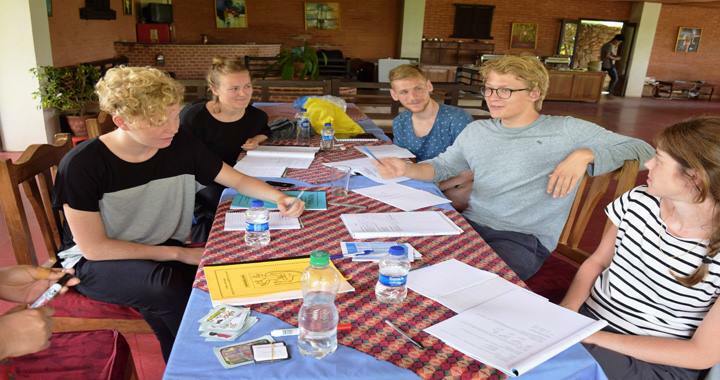 The course is taught in English and Nepali and includes coverage of the four skills of speaking, listening, reading and writing and a balance between communicative activities, structure practice and grammar appropriate to context. Our experienced professional tutors use a learner-centered approach Tuition takes place in a comfortable, friendly and relaxed environment at times, which are convenient for learners. Basic Course in Nepali is suitable for the people planning to live and work in Nepal long-term (two years or .